I am looking to put myself into another car soon. I want an AWD car with a diesel and BMW seems to have the only one on the market aside from the VW group. I cannot justify nearly $50K for a new car but I found several in the $30K range with less than 40K miles. Is there a "break point" on mileage when the BMW becomes problematic or just to depend on how well you care for the car with regular maintenance? Is paying the premium price for one that is Certified worth it? The gas model isnot an option; I'm not paying for premium fuel. As far as diesel 3 series go, the i6 diesel is a blast, I have no experience with the newer 4cyl diesel. I would go certified pre-owned on any German car. Costs of repairs can quickly get absurd if you don't plan on doing any and all labor. Generally the 3 series are pretty reliable, however if you're less than lucky...well...its gonna get expensive. As far as miles before things start to break, impossible to say. Sorry if there are some typos, my phone thinks it's hilarious to autocorrect to absurdity. I have owned 2 3 series BMW's in recent years and my opinion is based on these cars and alot of web research....there are some BMW models (328 6 cyl) that are pretty reliable and others (330i, 335i, 528i, 530i, 7 Series) that you should avoid like the plague. Here in Phoenix the diesel average price is $1.99 while gas is $2.21. I'd ask myself if 20 cents per gallon is worth the possible headaches that an all-wheel-drive, turbo-charged, diesel BMW may bring, not to mention the stupid purchase prices of just buying the car. 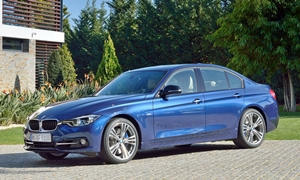 From research I looked for the most reliable BMW 3 Series with the lowest mileage. I wanted the smoothness and proven reliability of a normally aspirated 6 cylinder. I found a 2011 328i with only 27,000 miles on it for $22,000. It had 6 months of factory warranty. I'm like that Camry guy in the ad who wants any excuse to drive my car. It is truly wonderful. I put some Bridgestones on it and installed a $9000 battery and I was good to go. I have purchased over 30 cars over the years and can truly say this little 328 is the best. BMW is getting stingy with their CPO and maintenance and they would not transfer the CPO to me. So far, though, my car has performed flawlessly. I'll cross the ungodly repair cost Rubicon when and if it appears. We have alot of BMW service outlets in the Phoenix metro area so I should be ok. In summary, the complexity of the the engineering of these cars necessitates some sort of financial safety net. In the absence of that, buy the most reliable you can find - the e90 chassis. I think it was Car and Driver that gave the e90 (2006 to2011) the edge over the f30 (2012 until now). They felt that the newer car rode just like your mother-in-law's Buick. Something has happened at BMW wherehe "Ulimate Driving Machine" has become "The Ultimately Expensive German Car with Lots of Silly Stuff." Check out the feature that shuts off the engine every time you stop. Why does my $50,000 car feel like a John Deere tractor when it starts up? +1 on jrkr1778's responses. I've owned five bmw's and my experience is that they are most troublesome EARLY, as in the first 50k miles. So warranty is needed and cpo valuable too. Then, from about 50-75k+, they just work, needing only wear items. Then, at about 150k, they start needing the larger items that, in BMW cases, cost more than average cars to repair. Find a good independent service shop, one that has the computer and is certified to change software too. I love my cars, but they are indeed over engineered and need to be sorted out initially. I drive a 2015, 328 awd 4-cyl gasser. My sister-in-law had a 2002 BMW gasser for 14 years (very few problems, none significant) and I also traded a diesel VW just before the emmissions scandal erupted. A couple of questions for you. Why does the diesel attract you? Is it torque or a wish to get higher mileage? How many miles do you plan to drive it each year? How many miles in winter conditions and what length of trip? If it's torque, then I find the 328 gas motor plenty powerful, and I've been averaging 32 mpg. You'd have to drive many miles to save money with the diesel. Perhaps you will, but do the math. Yes, the diesel does have more grunt driving around town, and that is fun if you do a lot of urban-suburban driving. A couple of things about diesels: Diesel fuel is expensive and it can be a real pain to find sometimes. I live in "corn country" - the Midwest, where diesel pickups are everywhere, so diesel and biodiesel are easy to get. Even then, at a busy gas station, there are ususally 10 gas pumps for every diesel pump. Drive in a place where there are fewer diesel pumps and it can be a major pain to find an open pump. Pickup owners take their time filling huge tanks, then filling equipment hitched behind the pickup, etc. (I once waited 20 minutes in Michigan for an open diesel pump.) And, with a BMW's fill on the "wrong side" you are at a further disadvantage getting to a pump. Truck stops feature enormous spigots that pump fuel at an astounding rate. One slip and you have diesel all over you, the car, the ground. Ever tried to wash diesel fuel off your hands, your shoes? It's hard to do. I always wore gloves when pumping diesel becausemany diesel sellers do not clean their pumps. So, they are encrusted with fuel that gets all over you. Spilled fuel sticks to your shoes. I am not a fussy person, either. It's just a downside to diesel. On short trips, diesels don't get very high mileage, particularly on a cold engine. There are people who will drive nothing but a diesel. I found the costs not worth the hassle. I also think you should seriously review your feelings about money. If premium gas seems like a waste of pennies, is a low-volume luxury car a good fit with your sense of economy? I am not being critical, either. I value economy. Owning an expensive car is going to be expensive. That could ruin the experience for you. Here's a suggestion to consider: Become a member of BMW car club of America. Read the wonderful magazine you'll get each month, and you'll learn a lot about what it's like to own a BMW. All the fanatics write in, and you'll get the good side, but you'll also read about the downsides. Then, if you decide to proceed, you can buy a used BMW from a member who has lavished care on their bimmer. You'll get a better used car and a better shot at avoiding those punishing repair costs that can occur. In the meantime, while you consider, drive a used Mazda 3 or something fun that is also reliable and economical. I have an '05 3-series and have owned a number of other BMWs prior to that including the company's first AWD model, an '88 325ix. There is no mileage above or below which will guarantee you're not going to get stuck with the prior owner's problems. Personally I'd like to know how the vehicle has been used. Repeated short trips and low speeds are not good things; I'd rather have a car that's regularly had the chance to stretch its legs. As for paying the CPO premium, that depends. If you want the reassurance that comes with the knowledge that if something goes wrong during the coverage period that you can get the dealer to fix it, then go that route. Otherwise, look for a vehicle with a documented service history. And whatever you do, get a thorough buyer's inspection. It may set you back $200 or so, but if you avoid a problem child, that's money well spent. As for issues with the cars themselves, check that everything electric works. Fixing those gremlins can cost a lot. Also, suspension bits don't last as long as one might expect. Control arms and bushings are the most likely components to go first and are on borrowed time once you hit 60k or so. As those are considered "wear" parts, they probably aren't covered by the CPO warranty. And depending on how the car has been driven, you'll be replacing a radiator sooner or later. When you do your buyer's inspection, pressure test the cooling system. Finally, you might want to check out Mercedes as they also have AWD sedans and coupes. I currently have a 2014 03 diesel that has been problem free. Additionally, I have owned numerous BMWs in the past and can only say I concur with most of the comments posted concerning BMWs. Diesel ownership really depends upon location and use, I have also had several different diesel cars that all were reliable. My only negative thought about BMWs today is the use of run flat tires, they may be practical and allow one to get home without changing a flat but any issue will cost you a new tire. There are lots of areas in the US that don't have BMW rated run flat tires in stock so you may have an issue if this is a 'road' car.